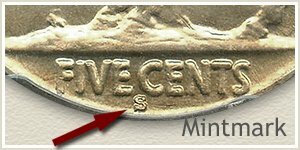 The minimum 1930 nickel value is in a narrow 91 to 95 cent range. 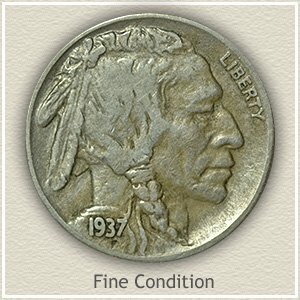 A good start and nice value, however with a closer look it's possible your Buffalo nickel is worth more. Minted at two facilities, Philadelphia and San Francisco, both are close in value. 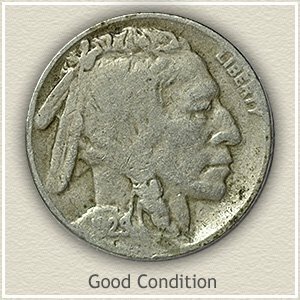 The San Francisco Buffalo nickel does have a premium as you get into the higher condition grades, but it is not a break away rarity. The amount of wear and abuse your coin has endured is what decides your 1930 nickel value. Examine each carefully, how well the coin has survived determines how much it is worth. 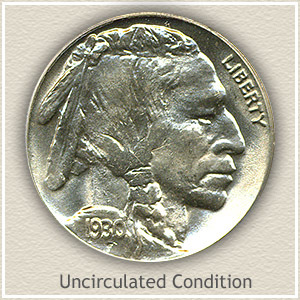 The "uncirculated" Buffalo nickel pictured is high on the want lists of collectors and rare coin dealers. With nice starting value the 1930 Buffalo nickel is a little treasure to find in your box of old coins. The 1930 "S" listing is a coin minted in San Francisco, no mintmark was used by the Philadelphia mint. Find mintmarks on the reverse below the mound along the rim. The four grade categories highlight values of better condition nickels. 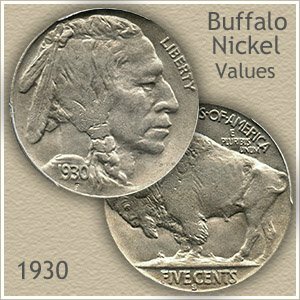 A wide gap in value is found between average circulated 1930 Buffalo nickels and those in better condition. Most of these old nickels are found very worn, in "Good" to "Fine" condition and worth less than a dollar. 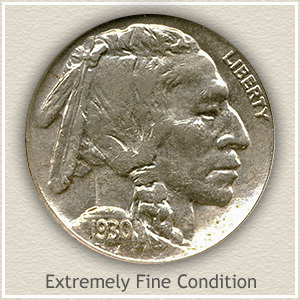 Valued noticeably higher are nickels in "Extremely Fine" condition. These coins are circulated and just slightly worn, however as you look through your old nickels this quality has an instant appeal that stands out against the rest. Collectors appreciate a superior coin and include many of these above average coins in their collections. In the later years of the buffalo nickel series greater numbers of coins were saved, both from circulation and new from the banks. It takes a very nice coin to break away from being worth a dollar. Extremely Fine: The shine of a new coin has disappeared from the surfaces. Slight wear has begun to show on the hair details of the Indian. On the reverse look for wear in the area of the front shoulder and upper back. Overall, still a well defined, collectible coin. Fine: Additional wear has reduced the major details and eliminated the finer points of design. Obvious loss of sharpness and an overall smoothness is evident on the entire surface of the coin. Good: A well worn coin defines this example. The date is readable although a merging of numbers is typical. Further wear of the rim, merges it into the lettering of the legends. Only major details of design remain on the obverse and reverse, producing a distinct flattening of appearance. This coin is on the low side of 1930 nickel value. 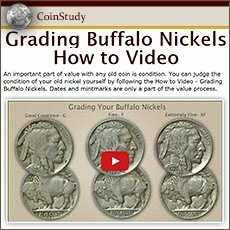 Check all your buffalo nickel values with the chart and separate the common from the rare. Rising prices, increasing demand from both collectors and rare coin dealers requires a second look at your coins. Including more relating to your 1930 nickel value. These early date Buffalo nickels are becoming valuable. 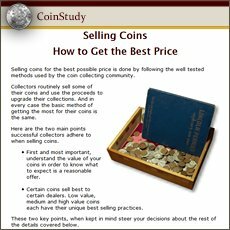 Before you consider selling coins, determine how much your old coins are worth. Coin Values Discovery... finds the 1930 nickel value and... all old US coin values. It is an excellent index with images and text links to all coin series, from Cents to Gold. Value charts, grading images and descriptions uncover how much your box of old coins is worth.